To preserve profit, contributor John Wilder suggests to purchase a medium-duty flatbed stake-side truck instead of the usual half-ton pickup. Tradespeople are relentlessly hit with higher prices, but find it hard to raise their own pricing structure. Thus it becomes imperative to find ways to save money so as to preserve your profitability. By the time that you are finished reading this article, I believe that you will agree with me that your best truck value is a medium-duty flatbed stake-side truck. Most guys buy half-ton trucks. First of all, a half-ton truck is simply a car chassis, with a car suspension, car tires, car transmission, car shocks, a car clutch or torque converter, and car brakes with a truck body mounted on it. It is not heavy duty enough to withstand the rigors of construction and the inevitable overloading of your truck with materials, which makes it dangerous. The half-ton truck offers little more crash protection than a car. As an example, I was hit with a loaded garbage truck and all I got was jostled around with no injuries. I had to replace the fender, hood, and bumper, but went to a used truck junkyard to get the parts and fixed my truck for about $200. Most customers will not take you nearly as seriously or as professional with a half-ton truck than they would than a competitor who pulls up in a medium-duty truck. This truck screams serious professional. The half-ton pickup screams amateur. A common problem is putting dumpsters in customer’s driveways. They invariably cause damage to the driveway, angering your customer, and they are expensive: $500 to $600 charges are not uncommon. With a stake-side flatbed, there is no damage to the driveway and your customer’s driveway is not blocked for several days with that ugly dumpster. You can put all your demo on the flatbed truck that hauls as much as a dumpster. Once you are finished with the demo, you simply take it to the dump site, where typically the prices vary from $35 a ton to $50 a ton. The average load is about two tons, which is way cheaper than the dumpster. If you hook two old tires together with a chain and then run a chain all the way to the back with about 4 extra feet, the bulldozer can hook onto the chain, back up, and pull all of your demo out in under 30 seconds, thus avoiding hand unloading or purchasing a much more expensive truck with a dump body on it. Surprisingly, flatbed stake-side trucks are much cheaper than the same-year used pickup. There is a high resale value on pickups because of the demand. The resale on the used medium-duty truck is much lower due to the lower demand. You should be able to buy a used medium-duty truck for $5,000 to $12,000 and, again, compare prices for the same-year pickup and see how much cheaper it is. Now the medium-duty truck is built massively and will easily outlast the used pickup truck by twice as long. If you get a truck with a diesel motor you can also have free fuel. You can burn waste vegetable oil from restaurant fryers or used waste motor oil. All you need to do is to invest in centrifuge filtering machine, which removes all the contaminants from the oil, and change out your fuel injectors or carb jets and you will never have to pay for fuel again. Now think about how you can use it. By having your flatbed truck you can pick up your own materials. Simply have the Pro desk pull your materials and let you know when they are ready to be picked up. They will load your materials for you with a forklift. You can save the $50 charge that Home Depot charges or the $75 that Lowes charges for delivery. 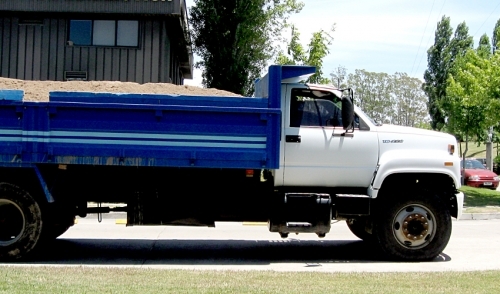 You also don’t have to have the materials placed in the customer’s driveway; instead, you can keep them on your truck and remove the materials as you need them. This is especially true if you are working on an unoccupied house where theft is common. By keeping your materials on your truck, you protect them from theft. With the massive dual rear wheels, getting stuck will be a thing of the past. You will also have way more ground clearance with a medium duty truck again assuring you of not getting stuck. Business promotion and advertising is always expensive. There are ad agencies paying car owners up to $800 a month to have a customer’s ad on their car. With a 24-foot-long flatbed with 4-foot-high sides, you can have massive billboards on both sides of your truck advertising your business. Again, this screams professional and is way better and way more visible than advertising on the side of your pickup. Now, let me know if you have become a believer--or would you rather keep your little half-ton pickup?